Was just at Pelikan's site where they're trumpeting this year's Ink of the Year, Olivine. I believe the new color has been known for a while but this makes it official. I saw something on their instagram feed about a month ago. Looking at it again just now it was January 12th. They said it would be available in March in the comments. Someone asked specifically about a matching M200 and was basically shut down. So no confirmation of that. Around that time, Sarge Talon on thepelikansperch.com had something about it. The ink looks quite interesting. I find I really like yellow leaning greens (as opposed to the blue leaning ones). Would have to try a sample of it before being a full bottle of course, to find out how close it is to greens I already have. While I'm generally not big on golden greens, I have to say that the splash under the bottle does look nice, more dark green than overtly golden. But do I really need another dark green? I'll wait on the reviews to get a better look and maybe order cartridges. Hhhmmmm... ...I don't know about this... Monteverde has already released it. I will be in the queue outside the ink shop. Possibly the day before. With sleeping bag. I like green. I like grey green even better. I have every LE Edelstein since Garnet so will be getting at least one bottle of this one too. I wish I had the ones bef Garnet but didn't know abt them at the time. 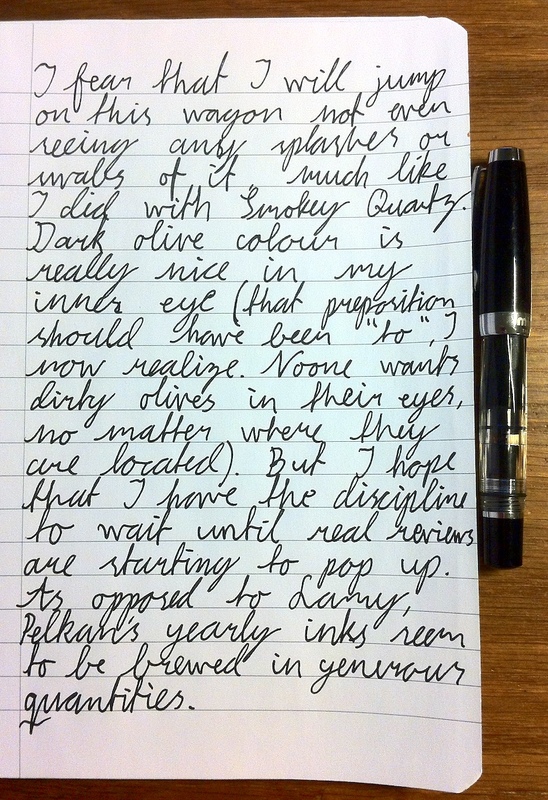 I am using Sapphire right now in my Pelikan Toledo 910. I received 2 new Pelikan pens in the mail yesterday so I need the new color.